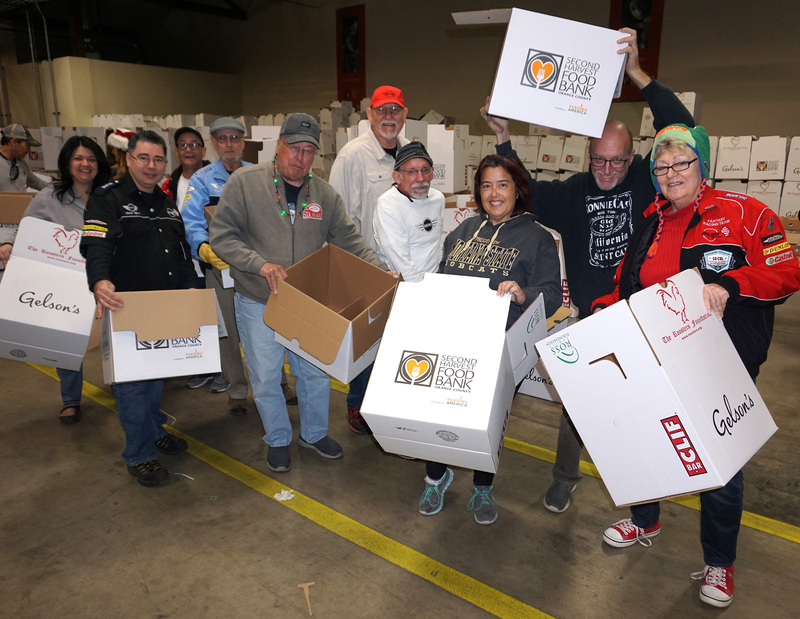 The Roosters Foundation Food Drive is set for December 16, however new rules this year have restricted the number of volunteers that will be allowed inside the Second Harvest Food Bank’s warehouse. While these restrictions have impacted the number of us who help fill the food boxes, the financial need to support this effort is still great. Please help us carry on this charitable tradition that veteran SCMM member Lowell Dickson started for us many years ago. Your tax deductible donation will help put a holiday meal on the table of a less fortunate family. Click HERE to donate online directly to the Roosters Foundation. Started in 1995 by past President Jeff Smith in the parking lot of Chanteclair Restaurant at 18912 MacArthur Blvd, Irvine (now an empty restaurant) with 100 boxes of food. “Because it was the right thing to do,” according to Jeff. When Jeff was elected president of Roosters in 2008, Jon Giberson became the event chairman. Jeff still serves as Chairman Emeritus. Joe Schoenig, Executive Director and Jerry Creekpaum, General Manager of Second Harvest Food Bank of Orange County invited us to have the Food Drive at their warehouse on the El Toro Marine base Irvine in 2008. This saved us several thousand dollars a year and improved logistics. Since 1995 the Roosters have given over 50,000 boxes of food to needy families. The food box contains a 15 pound frozen turkey, potatoes, stuffing, carrots, canned fruits and vegetables to feed 8-10 people. As of our 22nd annual event in 2017, we have fed over 500,000 people.